Oh dear, where should I start with this novel? I’ve heard a lot about Persuasion from my Austen friends, but I never really thought of picking it up until one day that I found myself without a book in the mall while waiting for my brother. My first Austen read was Pride and Prejudice, and I was planning to read Sense and Sensibility next, because…well, it seemed like the next logical choice, right? 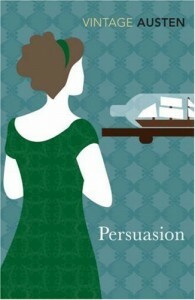 But everyone I know seemed to really love Persuasion so that won while I was looking for the next book to read. Suffice to say it waited on my shelf before I actually got to read it. At least it didn’t wait for 2 years as P&P did, but if I didn’t force myself to read this, I don’t think I would have finished it at all. A little background on why I had to force myself to read this book. I’m not a fan of classics. I made a resolution last 2006 to read 10 classic books in a year but only got to one (To Kill a Mockingbird by Harper Lee). The next year I didn’t read any and last year…I got to one, too. It’s weird because when I was a kid, I remember reading A Little Princess and The Secret Garden and Anne of Green Gables without even complaining of their old language. But now, I’d pick another book over a classic book any day. While I was planning one of my NaNoWriMo novels, I read a lot of references to classics that I couldn’t relate to because I didn’t read them. Then I read Jasper Fforde’s Thursday Next series and I felt left out because I don’t know most of the characters he mentioned in the series. I realized that if I want to be a writer, and if I want to be really well-read, I’ve got to pick up some classics and read them. I mean, they have got to be good — they wouldn’t be classics if they weren’t, right? Now I’m still learning to appreciate classics. They are still not my first pick among the books I have, but I’m giving myself a dose every now and then. It takes a while for me to get through the language, and if I stop reading for a couple of days I’m bound to get lost, but it’s a learning process I suppose. It’s a challenge, and well, I like this challenge, so yeah. It took me a while to really get into this book. I admit the first few pages kind of made my head hurt, because I couldn’t get into the language. But once Anne Elliot finally showed herself in the book, I started getting comfortable and I actually started liking it. A lot. I think the thing that really struck me here was Anne Elliot herself. I loved Elizabeth Bennet in P&P, but I realized how much I loved Anne more in this novel. Elizabeth was a feisty and strong-headed woman, someone who you’d want to have as a friend. Anne was someone who I want to be. She’s emotionally mature, with the way she deals with her family and her emotions especially with Captain Wentworth. She knows when to speak up and when to let it be. She keeps her appointments despite what other people say, and she has her mind and heart in the right place. It was sad that she’s such a social outcast in her family, but I think that gave her the character that made her so lovable. I bet she doesn’t even need to take some adult acne treatment, and if she needed to, she would have taken it with much grace. Who wouldn’t want to be her, seriously? “I beg your pardon, madam, this is your seat;” and though she immediately drew back with a decided negative, he was not to be induced to sit down again. I can listen no longer in silence. I must speak to you by such means as are within my reach. You pierce my soul. I am half agony, half hope. Tell me not that I am too late, that such precious feelings are gone for ever. I offer myself to you again with a heart even more your own than when you almost broke it, eight years and a half ago. Dare not say that man forgets sooner than woman, that his love has an earlier death. I have loved none but you. Unjust I may have been, weak and resentful I have been, but never inconstant. You alone have brought me to Bath. For you alone, I think and plan. Have you not seen this? Can you fail to have understood my wishes? I had not waited even these ten days, could I have read your feelings, as I think you must have penetrated mine. I can hardly write. I am every instant hearing something which overpowers me. You sink your voice, but I can distinguish the tones of that voice when they would be lost on others. Too good, too excellent creature! You do us justice, indeed. You do believe that there is true attachment and constancy among men. Anak! I love the Vintage classics cover! Although I got the Penguin cover lang. Hehe! I haven’t finished Sense & Sensibility yet.Eeep! Hehe! Just dropping by, dearie! Mommy Cathy: I have the Bantam version actually, but I used this cover on my blog because it’s pretty. :) I want to get that copy though, for collection’s sake. I’m a big Austen fan and though P&P is her most popular (in her time and until today), Persuasion is a beautiful story. I suppose you put it right wherein you have a character who knows when to act and compared to almost everybody in the story—her siblings and her closest confidant (Lady something…i forgot), she was the most level headed of characters. If you ever get to read Sense and Sensibility, I suppose at some level Anne Elliot and Elinor Dashwood have similar characters. The BBC rendition of Persuasion is pretty good. I just finished watching it in youtube. By the way, you have an interesting site. I’m sure to visit again.